More than 21 years after a bomb ripped through a Jewish community center in Buenos Aires, former president Carlos Menem, a former top judge and several other officials have gone on trial for allegedly derailing the investigation into Argentina’s worst terrorist attack. Menem, president between 1989 and 1999, was not in court to hear the charges. Rodrigo Borda, a lawyer for many families of the bombing victims, told reporters that the former president was not obligated to appear at this stage of the trial, which is expected to go on for months. However, Borda said there would be times when the now 85-year-old would be obligated to appeared, and would be jailed if he did not show up. “The charges are serious crimes,” he said. Prosecutors have accused Iranian officials of being behind the 1994 bombing of the Argentine Israelite Mutual Association, which caused the organization’s main building to collapse, killing 85 and leaving hundreds more injured amid the rubble. But no one has been convicted in the attack, which many Argentines believe has come to symbolize an inept and corrupt justice system that operates at the whims of politicians and can be bought off. The trial comes at a time when the bombing is very much in the public eye after the mysterious death in January of prosecutor Alberto Nisman. In 2004, Nisman was appointed lead prosecutor in the case by then President Nestor Kirchner, who called the investigation up to that point a “national disgrace”. In January, Nisman made a stunning accusation: that President Cristina Fernández, the wife and successor of the late Kirchner, had reached a secret deal with the Iranian government to cover up the alleged role of several Iranian officials. Fernandez vehemently denied the accusations. Nisman was found shot dead in his apartment hours before he was to elaborate to Congress on his case, which months later the courts would throw out. The men on trial include two former prosecutors, a former top intelligence official, former police officers, a Jewish community leader and a mechanic who owned the truck carrying the explosives. The charges carry sentences of three to 15 years. The trial is expected to focus on how and why Menem and the others might have wanted to bury the initial investigation. Testimony likely will delve into geopolitics of the 1990s, and even into Menem’s Syrian ancestry and how that might have influenced him. 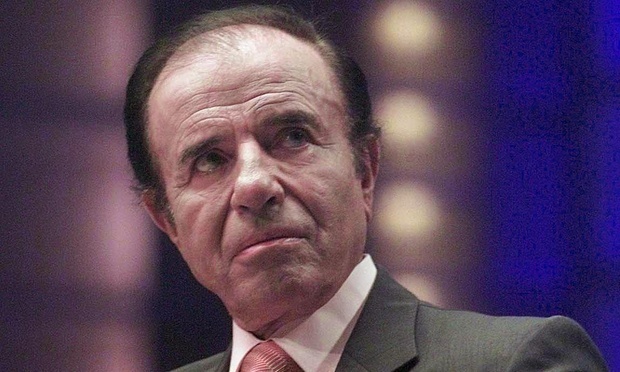 Menem, whose parents immigrated to Argentina from Syria, is currently a senator representing La Rioja province where he was born. Argentine authorities long have accused Iran and the militant group Hezbollah of being behind the attack. To this day, several Iranian officials are on Interpol’s red alert list, though the Middle Eastern country has denied involvement. Prosecutor Sabrina Namer is expected to argue that former judge Juan Jose Galeano, on orders from Menem, stopped investigating a “Syrian trail” that involved Syrian-born Alberto Kanoore Edul. Edul was detained when authorities discovered he had telephoned Carlos Telleldin, a mechanic who owned the truck that carried the explosives, days before the attack. Edul, whose parents had a personal relationship with the Menem family, also was suspected because he had a planner that included the phone number of Moshen Rabbani, at the time the cultural attache at the Iranian embassy in Buenos Aires. Prosecutors have accused Rabbani of masterminding the attack and continue to seek his extradition. Edul, who died in 2010, denied involvement. In an interview with the Associated Press, Galeano denied he received any orders from Menem. He said Edul wasn’t investigated further because there was no hard evidence against him. Calls to Menem’s lawyers seeking comment were not returned. Another central part of the cover-up charges involve the 1996 payment of $400,000 to Telleldin, at the time the only person detained in connection with the bombing. Galeano negotiated the payment, which came from funds from the now defunct Secretary of State Intelligence spy agency. The stated reason behind the money was to persuade Telleldin to tell authorities to whom he had given the truck. Telleldin implicated several police officers of the Buenos Aires province, a force that at the time was largely discredited in the midst of several corruption scandals. A dozen officers were detained and went on trial in 2001. The case dragged on, then after three years a mistrial was declared on the grounds that the payment to Telleldin had influenced his testimony. The 19 people on trial, including Telleldin and the officers, were absolved. Telleldin and some of the officers have been charged in the cover-up trial. Galeano told the AP the payment was a bad decision, but said that at the time authorities were desperate to solve the case.